This morning I found myself outside of myself, and looking into the vault of the heavens I saw seven most refulgent suns – but their shape was different from the sun which we see. It started with the shape of a cross and it ended with a point , and this point was placed inside a heart. At the beginning it could not be seen clearly, because the light of these suns was so great as to not allow one to see who was inside of them, but the nearer I drew, the more clearly it appeared that the Queen Mama was within them. In my interior I kept saying: ‘How I would like to ask Her whether She wants me try to go out of this state without waiting for the priest.’ In the meantime, I found myself near Her and I told Her; and She answered a curt “No”. I was left mortified by this answer, and the Most Holy Virgin turned to a multitude of people who surrounded Her, and said: “Listen to what she wants to do…” And everyone said: “No, no, she cannot…”Then, drawing near me, all goodness, She told me: “My daughter, courage along the way of sorrow. 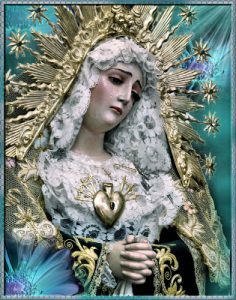 See, these seven suns which come out from within my Heart are my seven sorrows which produced much glory and splendor for Me. These suns, the fruits of my sorrows, dart continuously through the throne of the Most Holy Trinity which, feeling wounded, sends Me seven channels of grace continuously, making Me the owner; and I dispense them for the glory of all Heaven, for the relief of purging souls, and for the benefit of pilgrim souls.” While saying this, She disappeared, and I found myself inside myself. Dearest child, do not deny Me your company in so much bitterness. The Divinity has already decreed the last day of my Son down here. An Apostle has already betrayed Him, giving Him up into the hands of the Jews, to make Him die. My dear Son, taken by excess of love and not wanting to leave His children, whom He came to search for upon earth with so much love, has already left Himself in the Sacrament of the Eucharist, so that whoever wants Him, may possess Him. So, the life of my Son is about to end, and He is about to take flight to His Celestial Fatherland. Ah! dear child, the Divine Fiat gave Him to Me, and in the Divine Fiat I received Him; and now, in the same Fiat, I give Him back. My Heart is torn; immense seas of sorrows inundate Me; I feel life leaving Me because of the atrocious spasm. But nothing could I deny to the Divine Fiat; on the contrary, I felt disposed to sacrifice Him with my own hands, had It wanted it so. The strength of the Divine Will is omnipotent, and I felt such strength by virtue of It, that I would have contented Myself with dying rather than deny anything to the Divine Will.